Water ionizers have become a very common kitchen appliance as the public is slowly beginning to realize that ionized water has a lot of health benefits, aside from the taste. 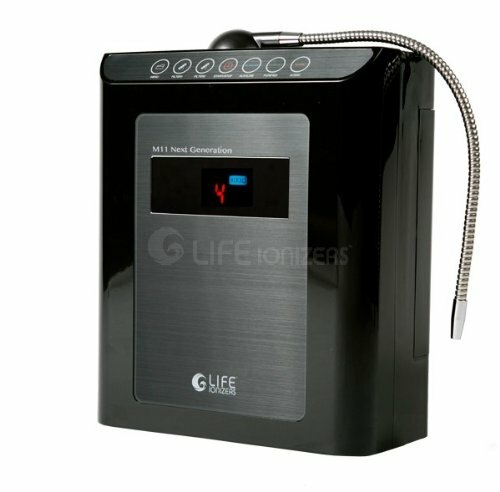 The Life Water Ionizer Next Generation M11 counter-top is one of the more advanced water ionizer models you’ll find in the market today, with a multiple stage filtration system and sleek, compact design that would enhance the look of your kitchen. The unit features the patented MESH technology of Life Ionizer. This feature enables the water to spend more surface time on the plates, thereby increasing electrical charge within the water. This results to increased water pH and Oxidation-Reduction Potential (ORP), which simply tells you that this ionizer can make your water very clean. Like other models from Life Ionizers, the M11 offers UV light technology. With this feature, the counter-top water ionizer can kill virus and bacteria through ultraviolet (UV) disinfection. UV disinfection does not make use of any chemicals to kill microorganisms, instead relying on electromagnetic radiation for an additional layer of protection. In fact many parasites that can’t be killed by chemicals are neutralized by UV disinfection. This ionizer also boasts of another key feature, the Vitamin C Ceramic Ball Filter technology. This is a medium that gets rid of chlorine, a very common toxin found in tap water. Chlorine in water has been associated with bladder and rectal cancer. The unit also has the Energy Frequency Technology of Life Ionizer which energizes the water coming from this appliance. Lastly, the unit is powered by switched mode power supply that regulates voltage. It does so by turning the electricity current on and off at a rapid pace, sparing the power transistor from dissipating excess power. This results to less wear and tear and makes the M11 very likely to last longer compared to other appliances. There are many health benefits to be gained by using the Life water machine. Drinking water that has been filtered by this appliance would hydrate your body, neutralize harmful acids and nourish it with easy-to-absorb minerals. Drinking ionized water detoxifies the body and removes acid waste products that are accumulated through the years from the intake of processed foods and prescription drugs. Acid waste products that are gathered in the body can lead to more serious health repercussions. Drinking ionized water, however, helps in neutralizing the acidity of these waste products and prevents them from affecting the cells and tissues. Ionized water can re-hydrate your body in a way that tap water cannot. Ionized water has around five to eight molecules for every cluster, unlike the 12-16 molecules per cluster of tap water. This means that ionized water easily gets absorbed by the cells thanks to their small cluster size, resulting to faster hydration. It also leads to flushing out of acidic solid wastes and toxins. Ionized water from the unit can also help lessen the risks of serious diseases like cancer. Ionized water has very strong antioxidants that can prevent cellular damage by eliminating free radicals. Drinking ionized water can also restore our body’s natural pH balance. Too much acid in our bodies caused by drinking distilled water, coffee, and soda can lead to serious health problems like cancer, kidney stones, joint inflammation, chronic fatigue, slow digestion, and osteoporosis. By drinking ionized water, you can restore the optimal pH balance of your body and lessen your risks of getting these ailments. In addition to this, many people have said that drinking water from the unit tastes a lot better than tap water and even distilled water. Aside from its health benefits, the M-11 looks good in any kitchen. It can also convert quickly from counter top to under counter thanks to the optional stainless steel faucet accessory from Life. It is also compact so space should not be an issue, and it comes in two color variations- black and silver/black. The unit is quite expensive but this next generation appliance is an investment that you and your loved ones can greatly benefit from. It brings a lot of health benefits that will justify its rather expensive price tag. By drinking ionized water, you can rehydrate your body and lessen the risks of acquiring many health diseases. If you value your health, then this water ionizer is well worth your money.